Check The Shack off of the list of burgers to try in Los Angeles. I had been searching for new places to try, and The Shack popped up on ChowHound. Sure why not...The Shack. Also, their website made the following claim: "The Shack offers some of the best burgers in town, as well as a pretty mean, authentic Philly cheese steak!" The Shack was a little Philly-centric sports bar on Wilshire where people from Philadelphia could congregate without fear of persecution...after all Philadelphia has historically served as ground zero for almost every disease epidemic in the United States...Yellow Fever, Typhus, Smallpox, H1N1, Legionnaire's Disease, Scarlet Fever, Cholera, etc...I am not making this up. Philadelphia is also the only urban center in this country where people still, and with alarming frequency, contract both cholera and polio...I may have made that part up. We arrived at about noon on Tuesday, and we were the only customers there...not a great sign. The claim to fame at The Shack was a burger with a butterflied Louisiana hotlink on top. We ordered a couple of plain cheeseburgers with the hotlink on the side, $8.45 each. Our food arrived in about 15 minutes. 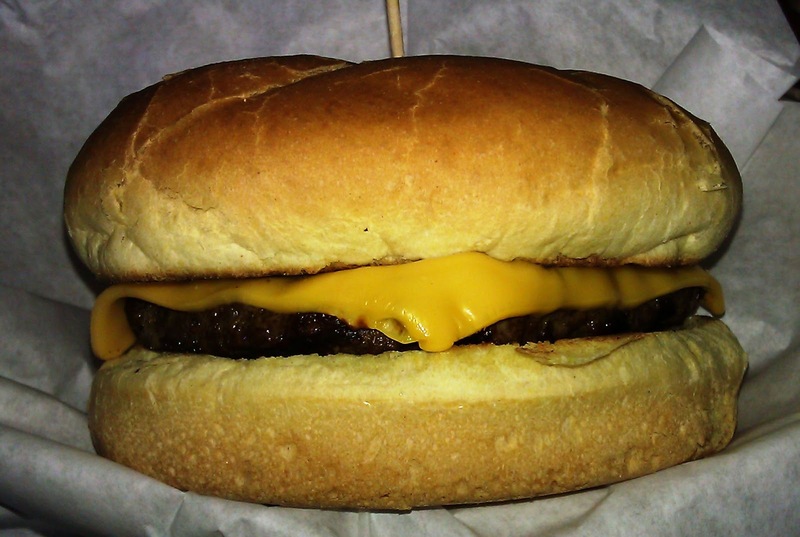 The Beef: The wee, 4 ounce, burger patties at The Shack were composed of Chuck. The beef was greasy, but it did have a nice funk to it. It was only mildly beefy. Aside from the blatant oiliness of the patties, the beef was OK. We tried the burgers with the hotlinks, too. That was a greasier mess. Also, the mild beef was overwhelmed by the spicy sausage. It was pointless. The Seasoning: This was barely discernible. It added nothing to the dish. The Sear: The patties were brutalized on a gas grill, so there was a sear, but this came at the expense of moisture and texture. The Preparation: Someone in that kitchen appeared to have it out for our burger patties. They grilled them to an oily, chewy Well-Done. 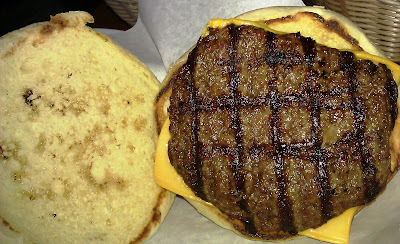 We did request Medium-Well, but the patties were so thin, that it would have been a challenge not to cook them too hard. The patties were irregular, so they appeared to have been formed in-house, but these cheeseburgers were so uninteresting that it seemed a waste of time to get more details from the wait staff. The Cheese: The American cheese was the only good thing about the burger. The cheese was just savory enough to compensate for the under-seasoned patty. The Bun: The was an un-seeded, semi-dry, egg bun. 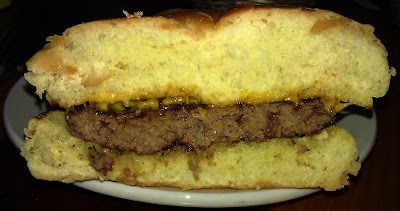 The bun was a little on the sweet side, but mostly this spongy bun was too dry for the wispy, over-cooked burger patty. I would have preferred that the bun been better toasted, but in this case (dry bun) that would have probably caused it to catch on fire. What actually happened, and this can be seen in the photos, is that the bun was wiped across a dirty griddle...gross. The Meat To Bun Ratio: There was way too much bun. Even after removing the bottom bun, there was too much bun. The burger patties were tiny, and the over-cooking caused the to shrink and dry out to the point where they couldn't tolerate much bun at all. 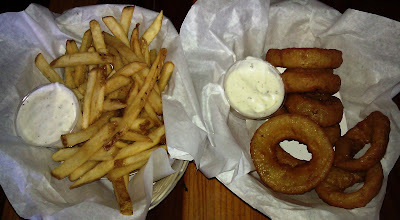 The Fries/Rings: The fries and rings were surprisingly good. They were both perfectly seasoned and browned. The fries and rings were nearly out of place compared to the quality of our cheeseburgers. The Value: The value at The Shack was very poor. It was just over $30 for a couple of very small burgers, a half order of fries, a half order of rings, and two beverages. Philadelphia has always been a source of national shame, and The Shack made it clear that Philly-style cheeseburgers were a major contributor to why, as a country, we collectively feel that way. Note that Philly's West Bar and Grill turned out one of the worst burgers on record. Philly, the St. Louis of the East Coast. Burger Review : Pass on the cheeseburgers...maybe the cheese steaks are good. Rating...2 Bites This was a grudging 2.5 until we both stood up to leave and felt stomach pangs from all of the grease that we had ingested.